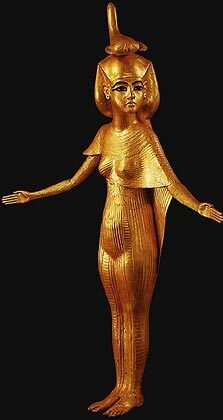 A goddess who was one of the four protective goddesses of coffins and canopic jars (the other three being - Isis, Nephthys and Neith). She is identified with a scorpion (sometimes appearing with a scorpion's body, othertimes she appears as a human with the symbol of the scorpion on her head). There are references to her in the Book of the Dead (as well as the three other protective goddesses). She was a daughter of Re, and so was also identified as the strong heat of the sun.